Who are these ‘Elites’ McCain Keeps Talking About? Brian Williams interviewed Sarah Palin and John McCain the other night on the NBC nightly news. He asked about her definition of “terrorism” with respect to Bill Ayers and my favorite question: What is an “elite” and who is a member of the “elites”? People who think they’re better than anyone else. Anyone who thinks they’re better than someone else. I know where a lot of them live. In our nation’s capital and New York City. I’ve seen it. I’ve lived there. I know the town. I know where a lot of these elitists are. The ones that she never went to a cocktail party with in Georgetown. I’ll be very frank with you. They think that they can dictate what they believe to America rather than let Americans decide for themselves. After listening to the interview, I found myself still asking, who are these “elites”? Anyone who thinks they’re better than someone else and will tell you what to do. Hmm … wouldn’t that include Sarah Palin and John McCain – who are telling us to vote for them? McCain seems to think elites go to cocktail parties in Georgetown which curiously enough he also attends. But he’s not elite. Just everyone else at the party. I would just like them to name a few of these elitists. Let us know who these people are. Because I’m starting to think the “elites” are just a figment of the Republican imagination. Republicans rail against “elitists” in Washington who are trying to stop them. Wait a second … haven’t they been running Washington for the past 8 years. I guess John and Sarah are just trying to identify with the Republican base who seem perpetually angry about these “elitists” – whoever they are. 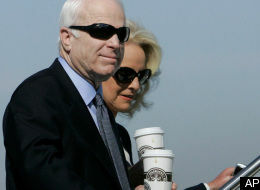 The trouble is that McCain and his wife are worth more than $100 million. McCain has been in Washington for over 25 years. And Sarah Palin recently spent $150,000 on clothes. Maybe money only makes you elite if you are a Democrat like John Edwards and you spend $400 on a haircut. I’m not sure. McCain and Palin seem to know an elite when they see one, especially when an elite disagrees with them. But they won’t tell me who is elite. One thing I know though. John and Sarah wouldn’t tell you what to do. They wouldn’t tell you to vote for them. Or they wouldn’t tell you Barack Obama is a terrorist because that’s not the kind of people they are. They wouldn’t tell you that you need to get rid of big government and liberal communists because they don’t tell people what to do. They would never tell you what to do or who to vote for because they are not elite.